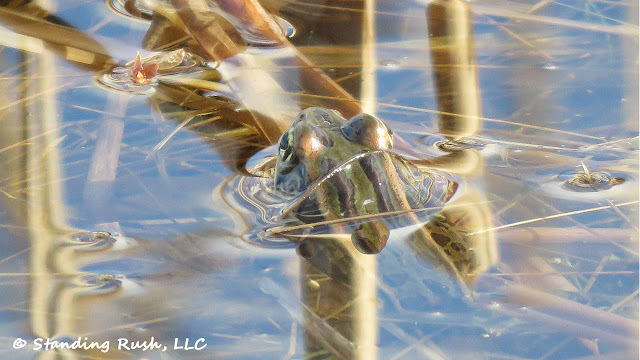 Yesterday afternoon, as I took a breath from dragging downed tree limbs off one of the dikes on a remote corner of the West Marsh, I couldn't help but find myself looking for the source of a chorus of amphibian love songs. The sun was bright, the mercury was climbing, and love was most certainly in the air. I grew up pursuing "pond frogs" -- mainly bullfrogs and green frogs (with the occasional leopard thrown in to really amp up the excitement) -- with reckless abandon. Much like my oldest son now, I love them and always have. 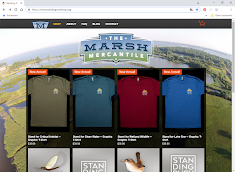 And while I'm certainly not an expert, particularly in identifying Ohio's frogs and toads by call, I have to admit that I've become pretty adept at picking their earth-tone form out of a watery cattail or bulrush lineup. That's what made yesterday's experience so awe-inspiring. What started as a casual gaze into shallow water eventually evolved into a 45-minute dedicated sit with the camera. I recall thinking to myself, "it sounds like there must be 1,000 frogs and toads out there," just based on the peeps and croaks vying for very species-specific attention within my earshot. As I've experienced many times before, the sounds were seemingly coming from everywhere, but when I focused on a specific area to try to identify the musicians, I was hard-pressed to find even a single source. 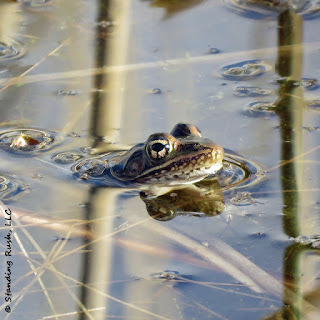 Finally, I was able to make out the telltale, bulging-eyed silhouette of a solitary leopard frog who, like its counterparts, lay nearly motionless just twenty feet away. I stress nearly motionless because the only way I spotted it among last year's downed cattails and this year's emerging reed canary grass is that it couldn't help itself from flinching a time or two as tiny midges bumped clumsily over the warming water's surface. One flinch caught my attention and a second flinch (pictured above) was caught on camera. The whole experience felt significant for a variety of reasons. (1) Hearing and seeing frogs and toads this time of year is a ritualistic symbol of the passage of time; it's spring once again. (2) Taking the time to slow down for just an hour or so paid dividends in getting to witness this frog just being a frog; I don't think he (or she?) had any idea of my presence. (3) True wildlife photography is tough. 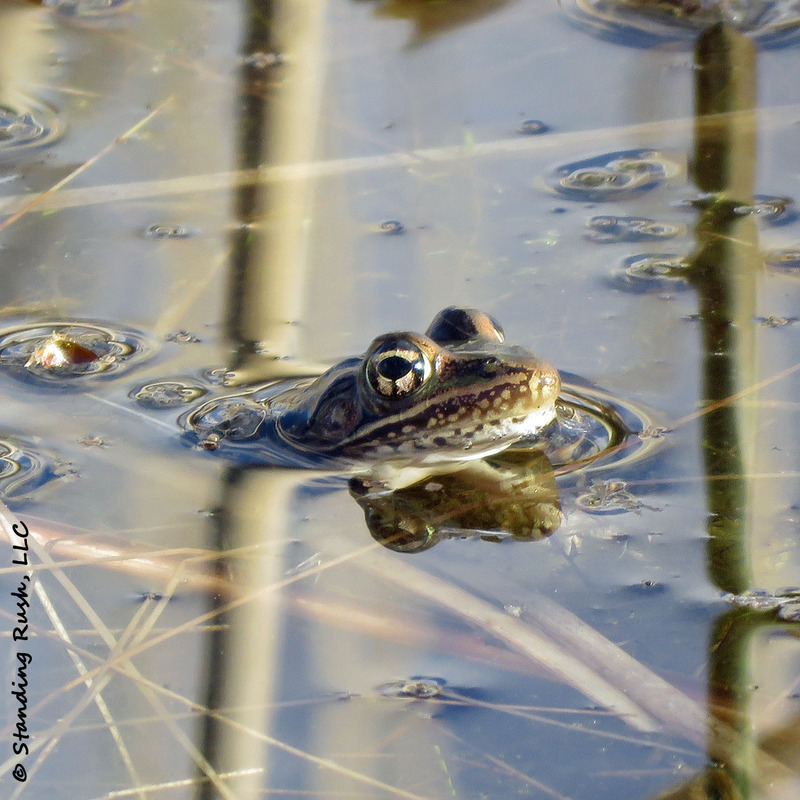 I certainly don't claim to be much beyond an amateur with a decent camera, but the effort it took to get a common photo of a common frog makes me appreciate that much more what the truly talented do "to get the shot." Wildlife doesn't commit to an agreed upon time or location for a photo shoot. The photographer has to work hard, be informed, be patient, and -- as the best one's will tell you -- get lucky.